We recently had the chance to meet up with a family friend in Ann Arbor, Michigan so we jumped at the chance. I knew we wanted to stay close to the University of Michigan campus since there are many restaurants, shops and fairy doors to explore within walking distance of the campus. Bell Tower Hotel seemed perfect so we reserved a room for a mother-daughter trip at this small hotel. 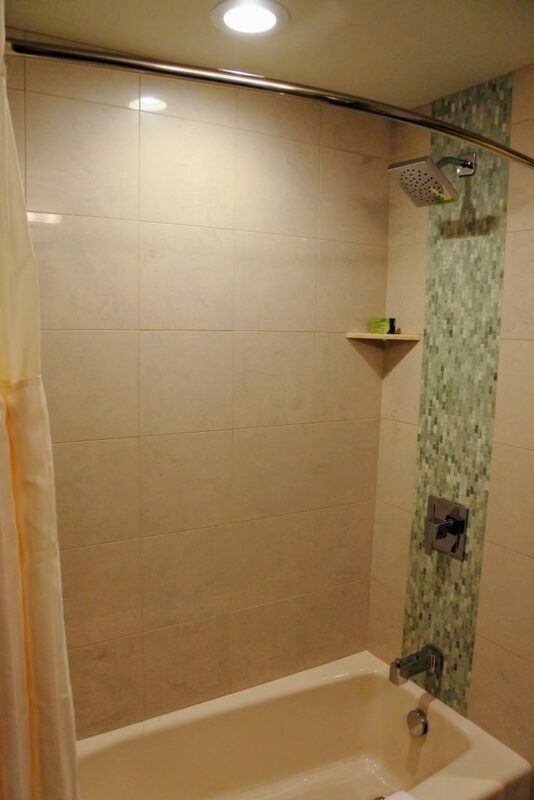 The Bell Tower Hotel is located at 300 South Thayer Street in Ann Arbor, Michigan. This hotel borders the University of Michigan campus on the west. 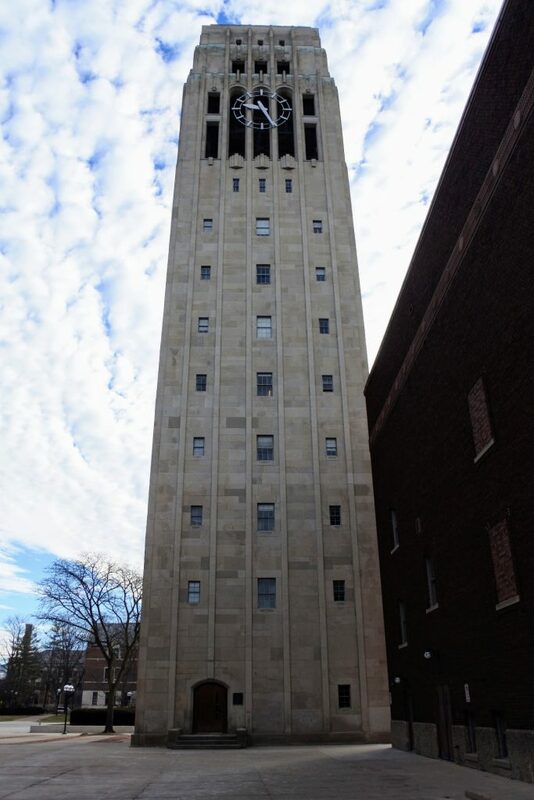 In fact, across from Bell Tower Hotel is the University of Michigan Burton Tower. Bell Tower Hotel is a small, traditionally styled hotel. It feels like it has organically grown over time. There are 53 standard hotel rooms with king or double beds and 10 suites of various styles available. When you enter the hotel there is a small sitting area before you reach the front desk. Check in and out were fast and staff was friendly. Bonus: You get a real key for your room! Note: To reach the elevators (or even the first floor of rooms) you must climb a half flight of stairs. Had I known that I may have opted for baggage help upon arrival. There is a wheelchair elevator to assist those who are unable to use the stairs to the first floor. We had a room with double beds. Inside there were two beds (which were really comfortable), a nightstand centered between them, a desk with chair, a sitting chair with ottoman, and a small corner TV stand with the ice bucket stored inside. 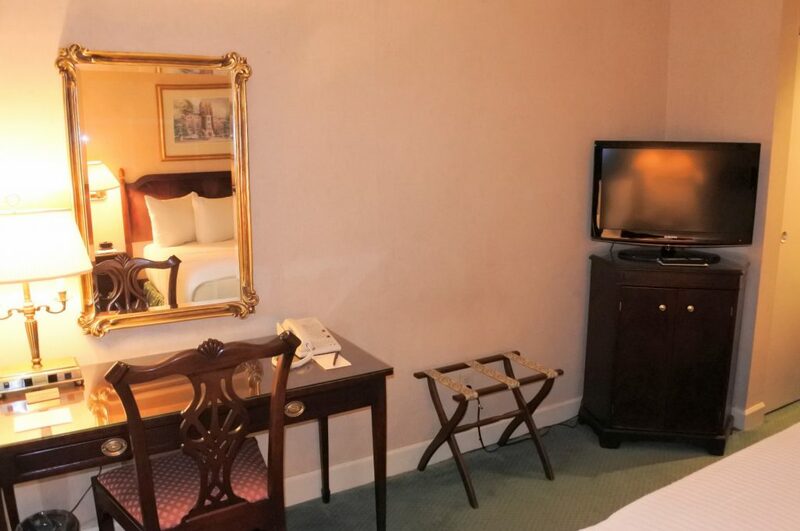 Some online reviews complained about the corner stand with small(ish) TV. For us it wasn’t a problem since we never even turned it on once. The bedroom area had traditional furnishings. There were some minor scuffs on the walls, but the room was very clean (this is a big deal since I am super particular about cleanliness). You could tell that the bathroom had been updated. 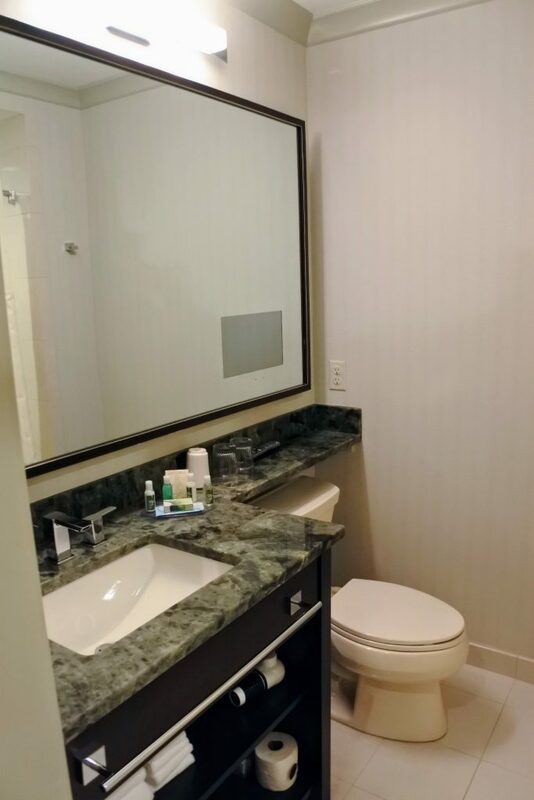 New tile, nice fixtures, and granite counters on the new vanity. Elizabeth thought the TV built into the mirror in the bathroom was the coolest thing ever. Again, the bathroom was immaculately clean. As we unpacked we noticed that the Burton Tower chimed every 15 minutes like a grandfather clock. We started to get worried that this would go on all night, but mercifully it stopped at 9 p.m. and did not resume until 9 a.m. during our stay. 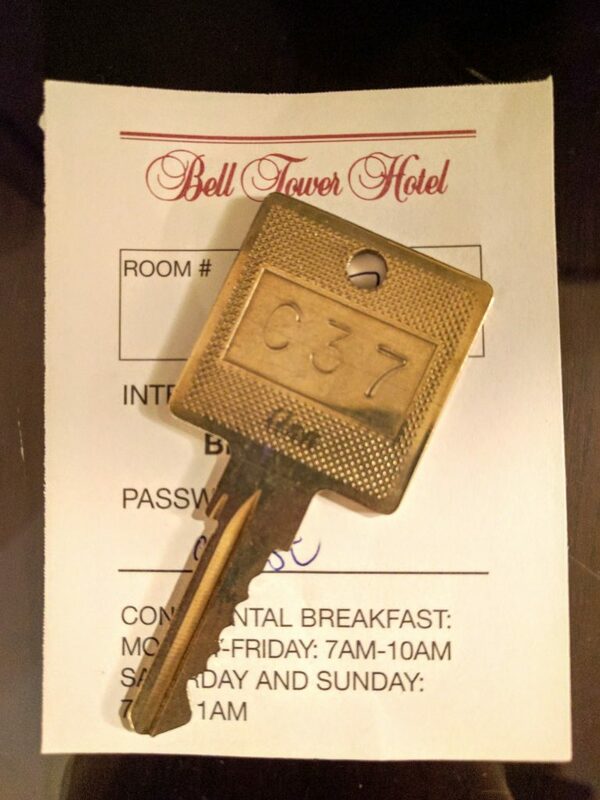 A free hot breakfast was included in our stay at Bell Tower Hotel. While we visited breakfast was served 7 a.m. until 10 a.m. Monday through Friday and until 11 a.m. Saturday and Sunday. We were told to find breakfast in the basement conference room when we checked in the night before. To get to the conference room you first take the elevator to the basement.When you exit the elevator you walk straight ahead and descend 2 more half flights before turning right to descend the 3rd and final half flight of steps. From here I followed the smell of bacon down the hallway until I found the conference room on the right. Breakfast was a step above a continental spread. and suited us perfectly. Assorted cereal, oatmeal, yogurt, and breakfast breads were available. 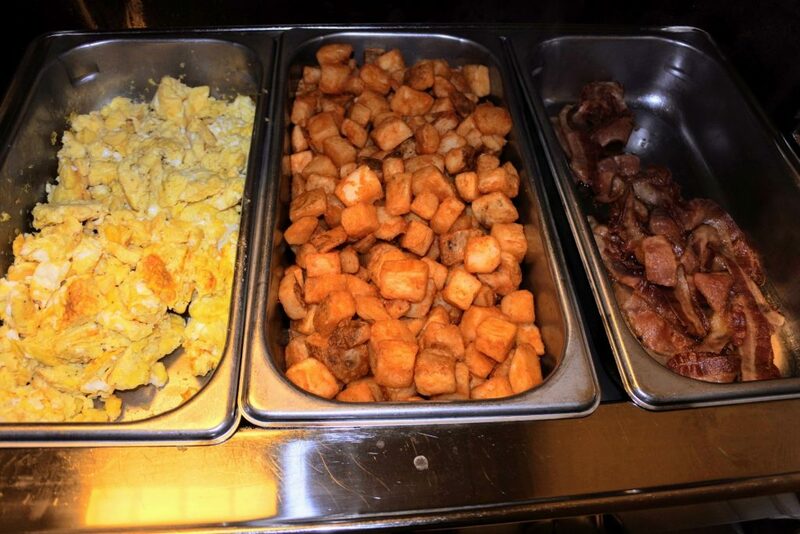 In addition, there were eggs, bacon and hash browns to round out your breakfast. For beverages we had milk, juice, tea and coffee (with to-go cups!) which was all I really wanted. Once we gathered our breakfast items we found a seat. 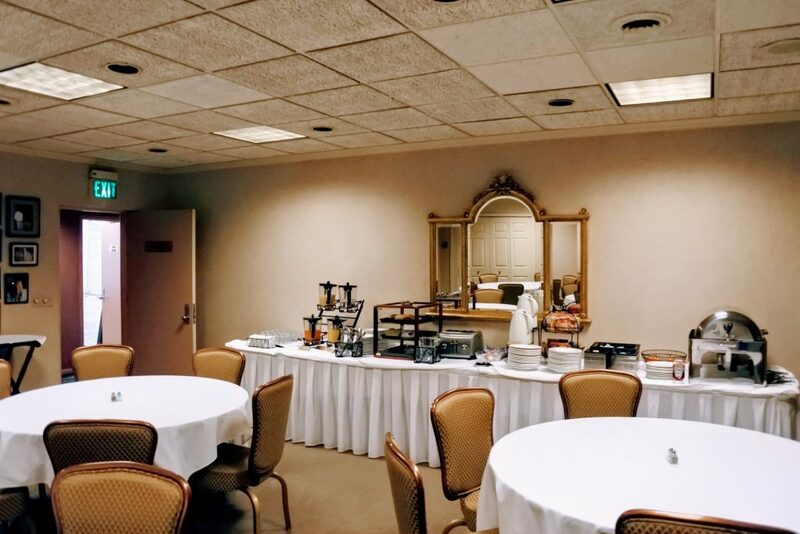 There were not many people in the conference room when we arrived for breakfast. There was one table of 2 and 6 tables with 6 seats each. A highchair was on the side of the room in case anyone needed it. It was nice to have a quick breakfast before starting our fairy door hunt. Wonder what a fairy door hunt is? Check out my article outlining the cool Ann Arbor fairy door culture. The only parking option at Bell Tower Hotel is valet. Since we were within walking distance of everything we planned to see this was not a problem. And even when we needed our car last minute to meet up with friends, getting the car was simple and convenient. To get your car, you call the front desk about 5 minutes before you need it. Valets are available 7 a.m. until 11 p.m. seven days a week. 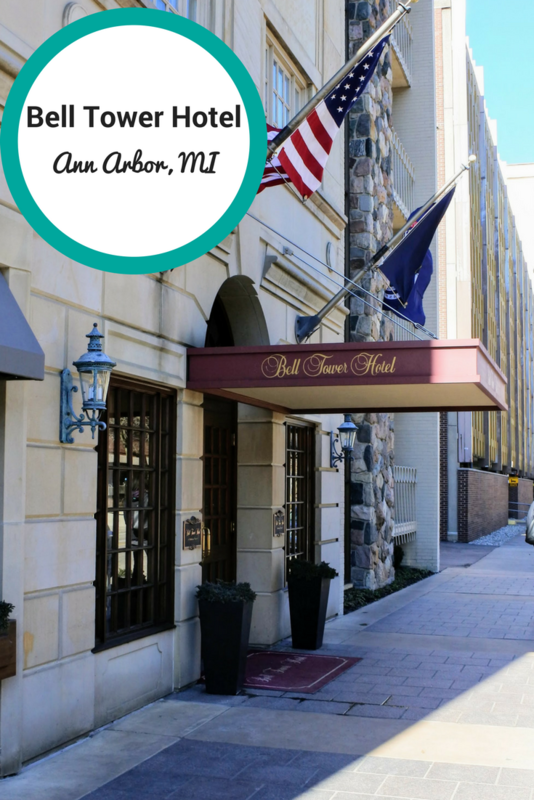 Bell Tower Hotel is the perfect location for a visit to Ann Arbor and University of Michigan campus. The hotel, although a bit quirky, had everything we needed. 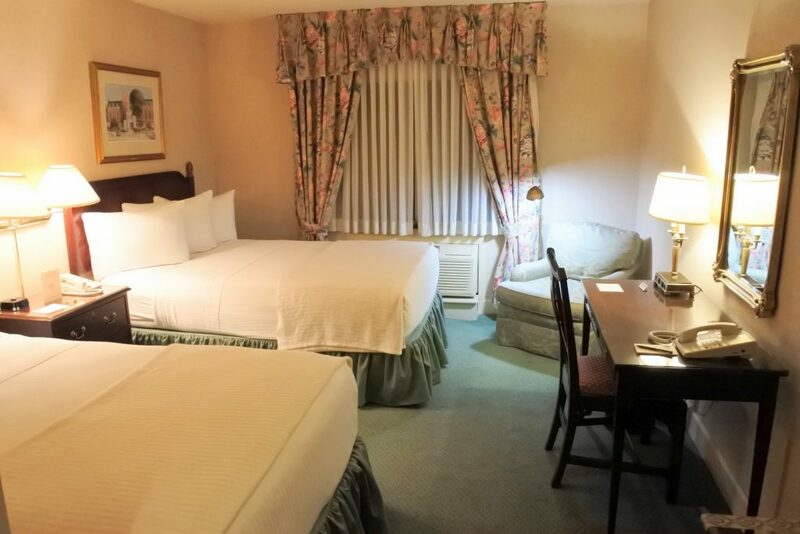 The rooms were clean and quiet with comfortable beds. The included breakfast worked out well for us (if you are looking for a bigger breakfast I recommend Angelo’s). The location was perfect to visit University of Michigan and search for fairy doors. We had a great stay and would absolutely stay here again. I was not compensated for this review in any way. The hotel looks really nice and comfortable to stay at. Nothing too fancy, just pure comfort and great experience. Love it!